Does Your Home Need a Littervention? Do you live in a multi-floor walkup and have to drag your heavy cat litter up flights of stairs? Could you use some help cleaning the litter box but your helpers have trouble lifting the litter? Tidy Cats® realizess that your lifestyle might be in need of lighter litter and that is why Tidy Cats is helping cat lovers lighten up the load with the LightWeight Littervention™ Contest! They teamed up with design enthusiast and lifestyle expert, Jenni Pulos to make over one lucky cat’s litter box are and help you lighten your litter box chores. Like most things in your home, cat litter isn’t a one-size-fits-all – different lifestyles call for different types of litter,” said Tidy Cats spokesperson, design enthusiast and lifestyle expert, Jenni Pulos. “Through this contest, Tidy Cats and I are showing the lighter side of litter by bringing Tidy Cats LightWeight to cat lovers and creating a new space for one lucky winner to enjoy with their feline friend. As a member of The Tiniest Tiger community, Jenni wanted to extend a personal invite to you to enter the Littervention Contest! Here is your message from Jenni in this short video. Entering The Tidy Cats LightWeight Littervention Contest is Easy as 1-2-3! Answer some simple questions including why you need Tidy Cats to lighten your load. One Grand Prize Winner will receive a complete load lightening experience, consisting of a visit from the Tidy Cats Littervention Crew, including Jenni, who will coordinate a $2,000 makeover of your litter box area and help check items off your errand and chore list with up to $1,000 of load lightening services. The winner will also get a two-year supply of Tidy Cats LightWeight cat litter and a $100 gift card. For more details on how to enter the Contest and for Official Rules, visit TidyCatsLittervention.com. 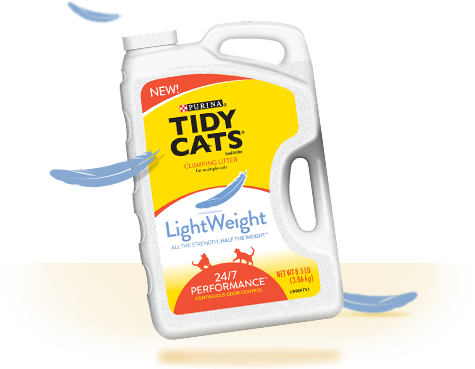 Tidy Cats LightWeight cat litter has light, tight clumps for easy clean-up. It is available in an 8.5 lb. jug for a suggested retail price of $12.99. For more information and to find a local retailer that carries Tidy Cats LightWeight cat litter, visit TidyCats.com/LightWeight. To stay up-to-date on news and happenings from Tidy Cats Like Tidy Cats on Facebook or follow @TidyCats on Twitter. To follow or get involved in the Littervention conversation, use #Littervention. This post is sponsored by Tidy Cats. I am being compensated for helping spread the word about the Tidy Cats Littervention Contest. However, The Tiniest Tiger only shares information we feel is relevant to our readers and the writing is our own. dont have a cat so cant upload picture, but shared on facebook.